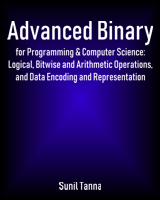 Below are details of my book, "Advanced Binary for Programming & Computer Science: Logical, Bitwise and Arithmetic Operations, and Data Encoding and Representation". If you have already read the book, or want other/more advanced resources, please click here. If you haven't already read, I have also written an introductory book Binary, Octal and Hexadecimal for Programming and Computer Science.